A personal moment inspired advertising and public relations alumna Sarah Shrek '18 to write "First Miss." Now the story is about to take center stage at UCF's Celebrates the Arts 2019. When advertising and public relations alumna Sarah Schreck ’18 talks about theatre, she can somehow, within seconds, bounce from talking about its power to create social change to emphatically saying “I will watch ‘Xanadu’ every month until the day I die.” She’s seen the ways theatre can be simply enjoyed, she’s seen the ways it can grow people and this weekend at UCF Celebrates the Arts, she’ll get to see her own play, First Miss, come to life. 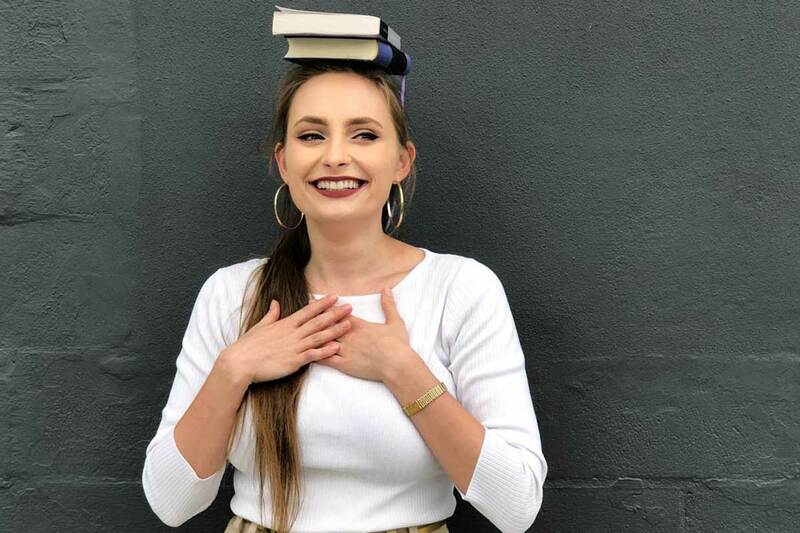 Schreck, who minored in performing arts administration and creative writing UCF and is currently attending Carnegie Mellon University for her graduate degree in arts management, was born and raised in Orlando. When she was 10 her family relocated to Jacksonville, but when it was time to pick the location of her undergraduate career, she had a feeling she should return to the place where she felt most at home. That was Orlando, and it became UCF. One of the most impactful experiences Schreck had during her time at UCF was a class that ultimately led to her involvement in this year’s Celebrate the Arts. She describes the class, Theatre for Social Change, as providing her with more confidence, courage and artistic ability to communicate. In the class, which is taught by theatre associate lecturer Sybil St. Claire, students learn new techniques of storytelling and how these nontraditional forms of theatre can be influential for audience members and performers alike. Of the many techniques, playback theatre is the one Schreck most took to and is what sparked an idea that became First Miss. In this form of theatre, there is a group of performers, an emcee and an audience. Led by the emcee, the audience shares feelings and stories from their own lives while the performers play them back to them. One day in class Schreck wanted to share one of her favorite stories to tell as a playback exercise, the story of her junior prom. Like most humans who went to prom, Schreck’s prom story is more likely to elicit a quick cringe and an “oof, that’s rough” than it is a John-Williams-scored-movie-moment. It’s the story of two teenagers, not sure if they like each other, little bit of miscommunication, touch of butterflies, and a slow song on the dance floor. When Schreck got involved with Project Spotlight, a student-run organization that gives UCF students a chance to take part in productions and develop new works, she knew she needed a good story she could turn into a one-act. She remembered that not only was her junior-prom story relatable for her, but fellow classmates were able to identify with much of the underlying themes. 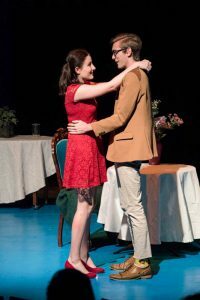 Nic Stelter and Zoe Blackledge performing in the original production of First Miss. As she started developing the story into an actual written play, she noticed it started changing and taking on new shape. Through her writing, the story deepened and started to take on more serious issues about adolescence. In the fall of 2017, First Miss had its first production and was so much of a hit that the team of folks who put together UCF Celebrates the Arts thought of it as a potential event in the 2019 lineup. Schreck was sitting on her couch in Pittsburgh one day when the previous artistic director for Project Spotlight, Liz Calvert, called to ask her if she’d be interested in being a part of UCF Celebrates the Arts. One caveat, she’d need to expand the script from one-act to full-length play. During her next round of writing First Miss, Schreck took seriously her chance to get input from different people with different backgrounds and walks of life. She asked people for their stories of adolescence, miscommunication, gender and relationships. She sought out her opportunity to tell a story that would, using elements of other’s real stories, address a wider audience. For Schreck, being a playwright is a chance to figuratively be several different people. It’s evident in her work that she appreciates and places great value in being able to embrace disagreement and accept a level of pluralism that acknowledges nuanced and ever-evolving thought and feelings. With playwriting, she can explore her own internal conflicts by giving voice to multiple sides of arguments or stories.